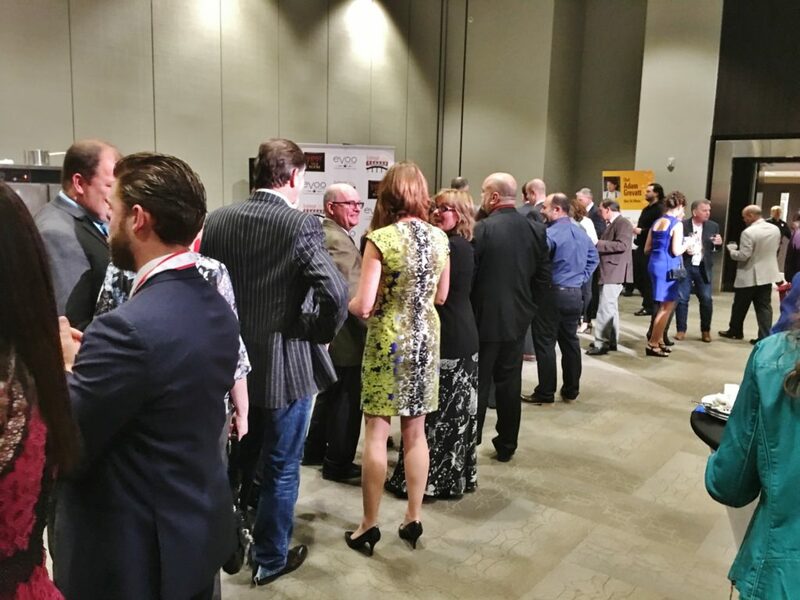 Going back to the Gold Medal Plates St. John’s culinary competition and fundraiser for Canadian Olympic athletes, held at the St. John’s Convention Centre last week, felt a little weird. I’m no longer a member of the St. John’s judging panel, so, apart from the few minutes I spent onstage presenting an award, which Gold Medal Plates was kind enough to name after me, I was there simply as a guest. I attended the competition with good friends, which was fun. We shared our thoughts on everything from the newly renovated convention centre – cavernous, minimalist and grey – to the bouquet slowly rising from a measured portion of Tantalus Pinot Noir. During the culinary action, each of us would select a chef’s competition plate and then rendezvous at one of the tall cruiser tables to taste and share our thoughts about it. I loved hearing what everybody – all wannabe food critics – had to say about their various plates. “I could go back and have that bowl of salmon all over again,” exclaimed Gloria. “This roulade would taste better chilled,” said Larry. “All I know is that that slice of meat reminded me of bully beef,” chimed in Chad. My friends love to eat, but, of course, they have their own individual palates, and their opinions – sometimes about the same dish – ranged from slightly divergent to being so dissimilar you could drive a Mack truck between them. Having the freedom to openly chat about the pros and cons of a dish with my friends and fellow guests was a nice change. As a judge, I tried my best to keep my opinions to myself. Judges must let the final marks speak for them, and in the end, whichever chef receives the most points carries the day. 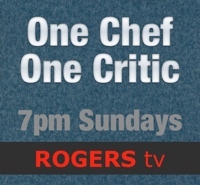 All seven competing chefs employed different main ingredients. Adam Gravatt of Blue on Water, chose salmon, Peter Ellsworth, Tavola, moose, Maurizio Modica, Fish Exchange, Arctic char, salmon and trout, Chris Chafe, Gypsy Tea Room, lamb, Steve Gugelmeier, Delta Hotel, venison, Shaun Hussey, Chinched Bistro, chicken, and Ruth Wigman, Oppidan, chicken feet. Indeed, Ruth Wigman served chicken feet, and ultimately her crispy chicken feet creation won first place, and for Wigman herself: one Gold Medal, one GMP golden plate, one week for four people at a villa in Tuscany, and the Karl Wells Award of $5000, to help defray the cost of travel to BC for the national championship. Wigman is a fine chef and had won a second-place medal previously at GMP. Her crisp seasoned chicken feet with Sichuan style glazed dumpling, charred scallion purée, crustacean reduction and whelk was by no means a crowd favourite. Many guests were completely put off by the idea of eating the feet of a chicken; and, let’s be honest, visually, they’re a challenge. Chef Wigman softened first impressions with a small covering of lightly marinated greens. I liken this reluctance to embrace the offal to how mainlanders are generally put off at the thought of eating seal flippers and cod tongues. Yet, thousands of Newfoundlanders and Labradorians happily dine on both. So, here’s the point. It’s extremely important that Gold Medal Plates remains a serious culinary competition, and continues to be guided by the maxim that what is served is not nearly as important as how it’s prepared and cooked. 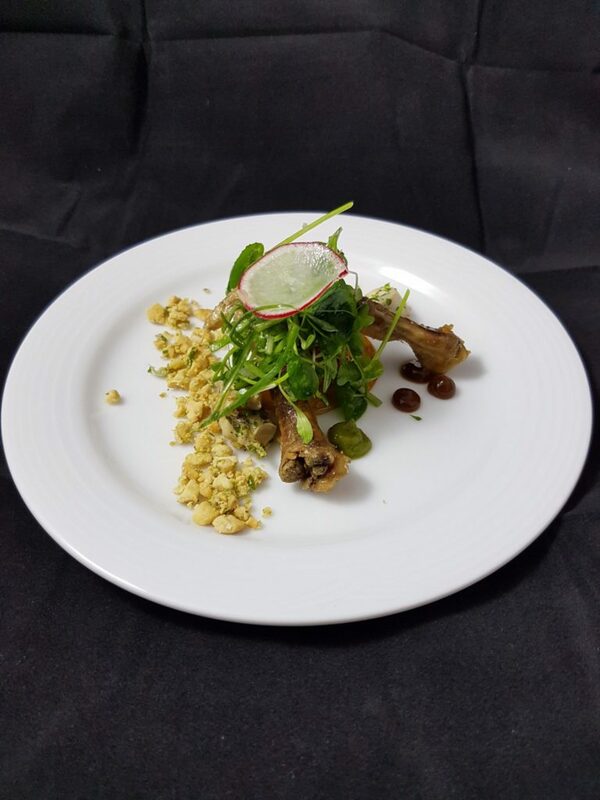 This year’s judges – led by James Chatto, GMP’s head judge, and St. John’s senior judge, Bob Arniel – felt Ruth Wigman’s choice was gutsy and that she did a masterful job of preparing all elements of her winning dish. Judges especially valued Wigman’s handling of the whelk on the plate. By cooking it sous vide she avoided the unpleasant result of rubbery, inedible mollusk. She also chose an excellent wine to pair with the Asian inspired dish. It was Gewürztraminer from BC’s Arrowleaf Cellars. 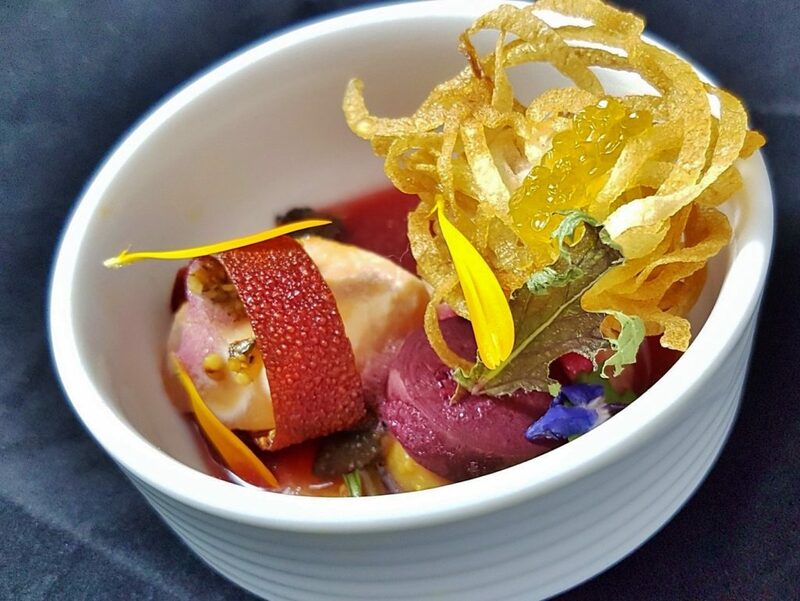 Shaun Hussey, Chinched Bistro, placed second with a very palatable dish that starred dark chicken meat and chicken organs. 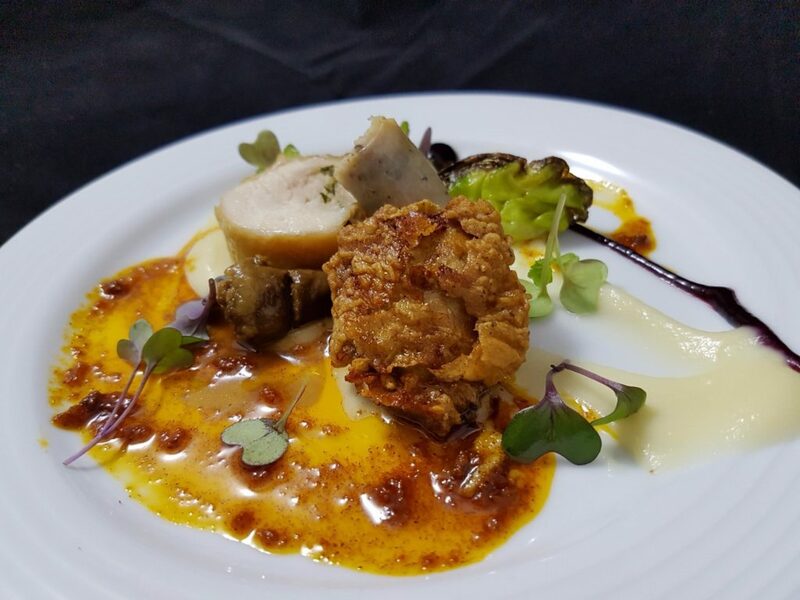 A juicy roulade of chicken thigh held the spotlight with a smoked chicken sausage, extras included chicken liver croquette, and chicken hearts cooked confit method. Adding to the poultry party was pork, in the form of nduja, a spreadable cured sausage known for its spiciness – although I didn’t find Hussey’s to be particularly spicy. No doubt he didn’t want to kill the overall effect of the dish, nor take away from the pairing with Tinhorn Creek’s Oldfield Cabernet Franc. 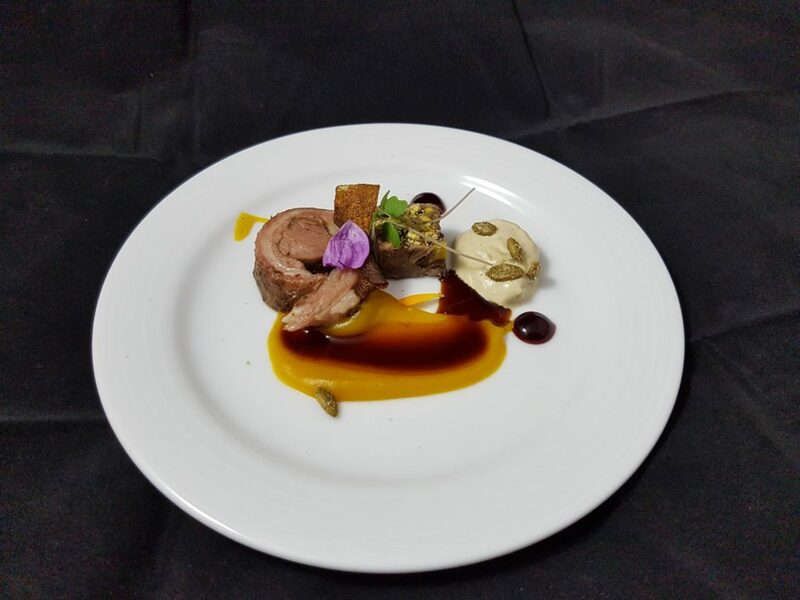 Third place winner, Chris Chafe, Gypsy Tea Room, acquitted himself admirably with a dish of lamb. He began with something akin to porchetta – a slow roast of pork, stuffed with various seasonings and garlic. Chafe called his production of belly lamb, lambchetta. Then he took the lamb’s liver and used it, along with butter and cream, to create a wispy mousse. Finally, he engaged pulled pork, sour cherries and pistachios to make a gamey terrine. Chef Chafe paired this robust plate with a relatively weighty Sandhill Wines Sangiovese. If the length of the queue at his station was anything to go by, Adam Gravatt, Blue on Water, would have been a run-away winner of a people’s choice award, had one been handed out. At first I thought the long line-up was the result of painfully slow plating, and, indeed, that may have been part of it. But, after my 15-minute wait, I realized it was just as likely that people were, figuratively, beating down the chef’s door because they’d heard he’d made something irresistibly delicious. Peering down into the bowl containing Gravatt’s creation, I was reminded of an exquisitely planned terrarium, resplendent with colourful shapes – red and gold beet chips, a slice of pickled red beetroot, golden pearls of char caviar, organic greens, blue and yellow petals – and obvious contrasting textures – potato crusted salmon belly, salmon fillet, preserved wild mushrooms, puréed potato, pinot noir foam and pepper and hemp seed praline. If nothing else, it was a satisfying feast for the eyes. But, it was much more than that. Gravatt’s dish – at least the bowl I selected – was perfectly balanced. There wasn’t a single ingredient that did not belong. The volume of everything was such that Gravatt achieved a tastable harmony with the dish, aptly named, “Wild and Tame Fall”. It had the wild earthiness of mushrooms and melt-in-the-mouth salmon, the zing of pickled beetroot and berries, the in-between tamer notes of puréed potato, and a broth of perfect salinity to tie it all together. After I’d spooned up the last drop of broth and emptied the bowl, I realized that it had given me everything I could ever have wanted from a meal. A crowd pleaser? No doubt about that, but it was also, like some other entries, a fine example of gastronomy or artful cuisine. It was quite evident that Adam Gravatt had put a good deal of thought into the creation of his dish. When a chef of his calibre, with talent and skill, makes that kind of investment in time and energy, the result is bound to be thrilling. 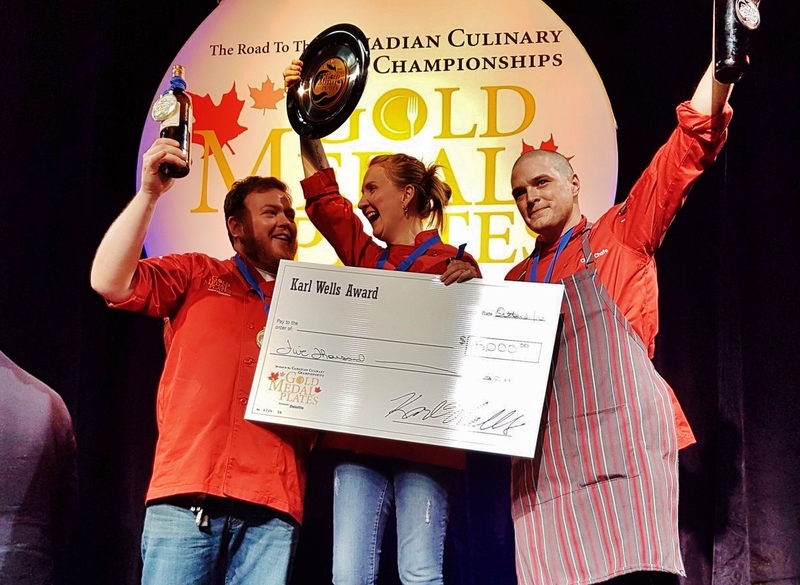 Congratulations to all chefs, especially Ruth Wigman of Oppidan at the Sheraton Hotel Newfoundland, our new Gold Medal Plates St. John’s champion. I know she’ll represent us well at the Canadian Culinary Championships in February.